Parkside Manor is an assisted living, and memory care community in Kenosha, WI designed to provide a full spectrum of services and senior care for our residents. 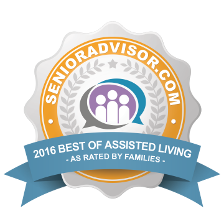 Assisted living gives residents the best personal care and support services available. Residents at our Kenosha memory care and assisted living community have a variety of choices based on their individual needs. Parkside Manor offers its residents all the amenities of 5-star living alongside dedicated, highly specialized Alzheimer’s and Memory Care in Kenosha, Wisconsin. Our state-of-the-art Assisted Living community helps you and your loved one get the most out of life thanks to our full spectrum of memory care services, beautiful surroundings, on-site amenities and fun social programs. At Parkside Manor, a wide array of services and amenities are available to suit each resident’s wants and needs in an atmosphere dedicated to the closeness of family and friends. Take a stroll along our serene walking path and through the lush garden, have some fun with friends in one of our life enrichment programs, or take a trip to explore the greater community. We are located in the heart of Kenosha, situated close to area shopping centers, Tinseltown Theater, the Civil War Museum, three full-service hospitals and more. Prior to moving into Parkside Manor, we speak with you and your physician to find just the right level of assistance that will allow you to enjoy your independence to the fullest. Together, we will create an Individual Service Plan (ISP) to guide us in assisting you. Our mission at this Kenosha memory care community is to provide a lifestyle that fosters independence, actively engages the mind, invigorates the body and nurtures the spirit while offering you and your loved ones the peace of mind you deserve. Although some communities insist on new residents putting down, non-refundable payments up-front, we do things differently. At Parkside Manor, we care about our residents’ financial health, in addition to their physical and emotional well-being. That’s why we offer our residents all the advantages of country club living without the expensive buy-in—just a simple lease. Our Kenosha Assisted Living and Memory Care community consists of spacious private and semi-private apartment homes, with varying floor plans and amenities. Explore nearby cities like Racine. Did this facility immediately make your loved one feel welcome? Absolutely, they always make me feel like I’m their only patient. Yes, I’m going tell everyone about them. I absolutely love this place! Very! The most welcoming office I’ve visited!